Developing countries will account for 90% of the new 2.5 billion urban population inflow projected by 2050. 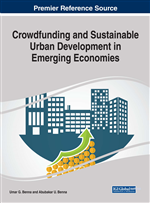 To provide decent urban environment new non-traditional financial sources such as crowdfunding are needed. In developing these sources, mutual learning experiences are the key to success but cross-cultural studies among cultures remain limited; this chapter seeks to address this issue. Africa and India are likely the key beneficiaries of future urban growth and most likely users of alternative finance tools to fund their growth. Both are slow starters in rapid urbanization and the use of crowdfunding but are making rapid progress. Developing nations, in their attempts to find adequate funds to finance their many huge projects to upgrade the quality of life of their youthful populations, have to depend less on the traditional funding sources thus turning to the emerging “alternative finance”(Cambridge Centre for Alternative Finance CCAF, 2017). They seem to be betting the development of alternative internal financial instruments and channels. In 2015, more than one hundred and forty-five billion dollars (US $145) was raised and it is still scaling up and spreading worldwide CCFI (2017). Crowdfunding is such an application which depends on the contributions of many to fund charity, social or business projects (Kirby and Worden 2014, Afrikstart 2016). It offers a cheap and effective alternative to traditional funding opportunities for innovative entrepreneurs, both social and private. Civic crowdfunding may be expanded to include the mobilizing of none-monetary assets –skills, labor, ideas etc. towards completion of municipal projects. Majumdar (2015) suggests that in the aftermath of the 2008 worldwide financial crisis, small entrepreneurs found it increasingly tough to raise funds. As a response, equity crowdfunding emerged as a viable option for mobilizing capital to support innovative, entrepreneurial ideas and ventures. Equity crowdfunding model merges the complexity of public funding, with the systemic risks of venture capital financing. Out of all the developing world, Africa and India governments are likely to mobilize more resources in order to lift their citizens out of poverty, provide hard and soft urban development infrastructure and put their citizens on the path to prosperity. Their selection, which is based on development finance needs consideration, may be explained thus: out of the 2.5 billion people to be added to global urban population by 2050, about 90 per cent of this increase will be concentrated in Asia and Africa (UN-DESA, 2014). The same projection shows that India (404 million), China (292 million) and Nigeria (212 million) will account for about 37 per cent of the increased urban population. Africa’s urban population is expected to triple by 2050 and so will be its slam population unless adequate measures are taken to avert the rise (UNDESA 2014. Thus, both India and Africa need massive urban development finance in order to move their rural majority to an urban majority as expected by 2050. Despite the popularity of crowdfunding in academy and practice, there is a lack of cross-cultural studies. To fill this gap, this research explored similarities and differences in the background of the two studied areas. The research evaluates the performance of both the local and foreign-based platforms and discusses the possibility of tapping into the diaspora markets by local platforms. The chapter reviews the key crowdfunding guidance instruments as they evolve with particular emphasis on regulatory instruments. The chapter is divided into five main parts. After the introduction in the first part, the second section sets out the general determinants of the crowdfunding market growth in Africa and India on a comparative basis. Section three evaluates the performance of the home- and foreign-based crowdfunding platforms while section four analyzes the markets development regulatory approaches in Africa and India. The final section proposes future research direction and conclusion.